These pages are witness that I have been a fan of Chris Black’s talents. No hiding it when positive reviews of NWOBHM/classic metal Pharaoh, thrashy and trashy Superchrist, dedicated Dawnbringer and even obscure Aktor were placed on this site. It seems that until now the only project of Chris’ I have not touched was High Spirits. Our former (hopefully not) colleague Stefan (where art thou?) did it with Another Night and now it is my turn to do it for You Are Here. I guess older dudes can’t quite shake their past off when it gets to 80s metal, since that is what High Spirits is all about. At first, given my lack of time listening to music these days, I thought I would make this review a copout. 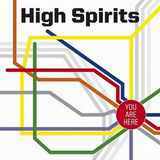 See, at the same time Hells Headbangers is releasing You Are Here, the label also put out a single with a pair of tracks, specifically, seminal and eponymous High Spirits and rare Night After Night from the very first demo by the band. My original thinking was to just describe the single, make mention of You Are Here and invite everybody who is not averse to historical metal of the 80s to sample the full-length. But then the temptation to give more coverage to You Are Here coincided with multiple spins through that album, so now I am sort of doing the opposite, reviewing the album and mentioning the single, and it is the right thing too. After reading this, go get You Are Here, but know that a 7” is lurking out there somewhere as well. With You Are Here High Spirits did not change one iota. Chris Black is incapable of betraying that act’s dedication to the high energy metal/rock of the 80s. The outfit maintains strict discipline and remains 100% nostalgic reminding me (and probably Chris given the similarity in age) of our formative high school age. Just about every song on You Are Here is built along a tried and steady blueprint of verse-chorus-verse-chorus-lead-chorus and absolutely straightforward but penetrating and hooky riffs. The drums are very simple, just sort of there to maintain the beat, but it would be impossible to keep your air guitar holstered when lead after lead will be played. And unlike those leads of guitar heroes extraordinaires’ of the 80s, High Spirits leads are there for you to follow, thinking that even non-professional can play them. High, almost effeminate, but epoch appropriate, vocals deliver lyrics about insecurities and love, a shocker for modern day metal, but the norm when I grew up. The whole experience bears no grimness, coldness or brutality, but instead fills the room with uplifting and rocking atmosphere. Describing individual songs on You Are Here is probably not so helpful, if you do not dig the general account above. When the Lights Go Down and One Thousand Nights are more speedy and assertive than earlier works, Reminding You of Me guitar lead work is very extensive, The Last Night relies more on a steady chug, which gets speedier by the time Can You Hear Me rolls along. (That song’s chorus is probably the silliest of all with an off-key touch to the vocals). Gone to Pieces is not an outright ballad, but does have a weepy feel to it, and I Will Run has a bit of an Americana touch. The album is closed with that pivotal eponymous track, which puts naiveté and sincerity of High Spirits in limelight. Whatever your attitude to High Spirits in general and You Are Here in particular would be, there is no denying that metal/rock had the decade full of music featured by this band. And given that this music coincided with what probably were the happiest years of my life, I will always remember the music we played at those high school proms trying to convince our girlfriends that metal/rock is better than disco or pop. Joshua Perahia, King Kobra, Witch Cross, Krokus, Picture and Scorpions, we tried playing them all, because we were afraid that Judas Priest and Iron Maiden would be too heavy and scary. We did not succeed, so I sincerely hope Chris Black does, the lyrics on You Are Here calling on and on for that elusive girl of his dreams to join him in rock celebration, and after that maybe something more intimate than that.